Well good afternoon all on this cold and windy day. Well today I decided to have a chillaxing day as I am doing my first race for life tomorrow yikes. 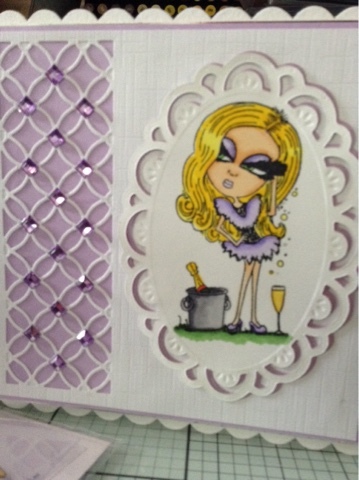 Purple co ordinations on top of the silver mirri card and also cut out a die'sire cameo stamping frame. I coloured Chelsea in with my spectrum noir pens which I will list below. Gorgeous card, love the image!